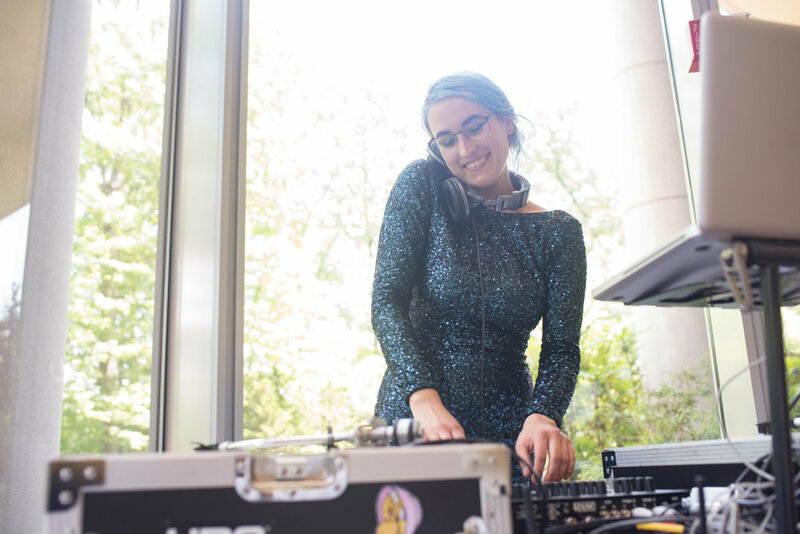 DJ Alkimist both DJs and plays viola or violin for weddings, whether they be traditional, unconventional, LGBT, destination weddings, or just celebratory dance parties. She also plays for engagement parties, anniversary parties, and divorce parties. DJ Alkimist also offers additional services: Consultations, additional speakers, MC, microphones, liability insurance, uplighting, drapery, do-not-play list, photography. She specializes in all types of music, including: Club, top 40 and pop, electronic, house music and EDM, hip hop, r&b/soul, funk, disco, throw backs, Motown, deep house, Latin (reggaeton, salsa, cumbia, bachata, merengue, etc. ), international (including Afrobeats, Persian, Indian, and Middle Eastern), jazz, oldies, rock, indie, reggae and dancehall, and female artists. Book her for your wedding, engagement party, or anniversary party now!